"The Nine" with our host Madeleine Voirin at the airport just before departure.
" Alone at Last! " Geoff Sims' stunning wide field totality image. Joe Cali is the lone figure sitting on the sand spit behind his refractor. mother natures great spectacle front and centre. 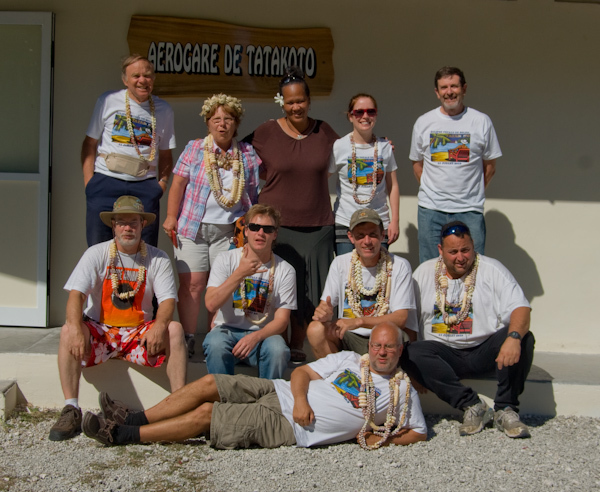 We arrived on Tatakoto on July 6th, 5 days ahead of totality. 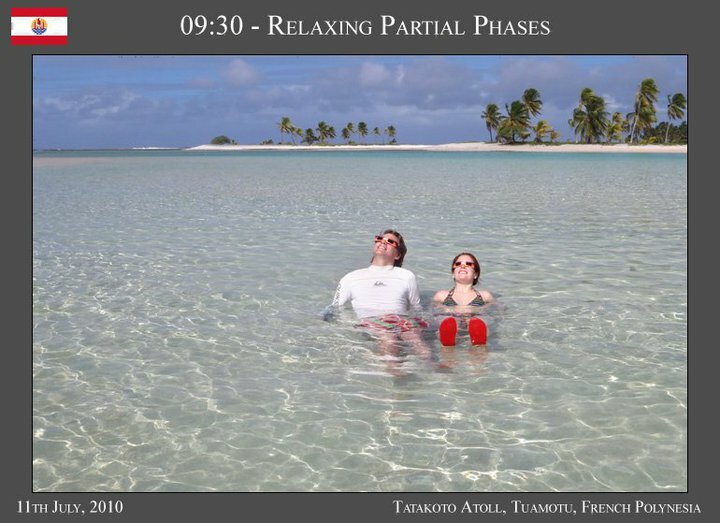 relax and get over jet lag or fatigue before moving on to Tatakoto. pamphlets (written in French) for every member of the local population. from the lagoon side of Tikahana Motu. 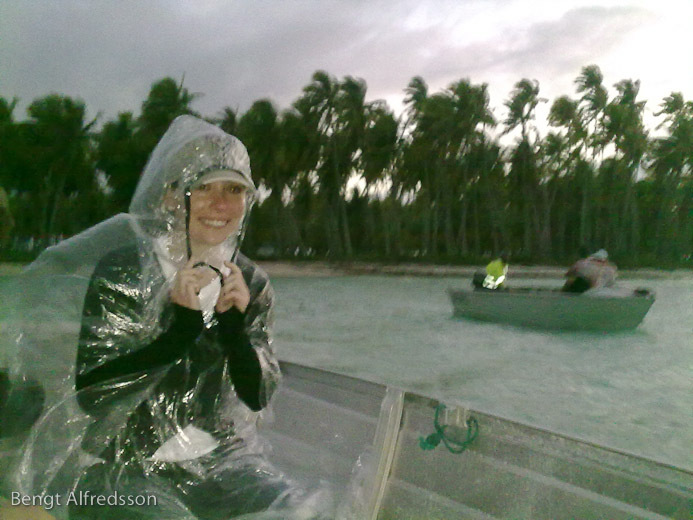 down the lagoon - an 80 minute boat trip. Different team members had different goals so following the scouting trip, the group decided to divide up on eclipse day. 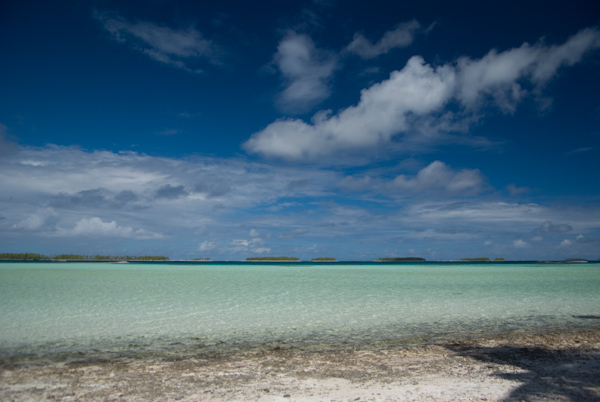 stay to the north side of the island on the ocean beach about 2.7km north east of our location. two brief rain showers and lots of cloud as we set up. Bob was back in the town of Tumukuru (see larger scale map above). in town had similar experiences and we will send detailed reports and make imagery available in due course. discovered that four of us had recorded shadow bands projected onto this low cloud. A first in eclipse photography. 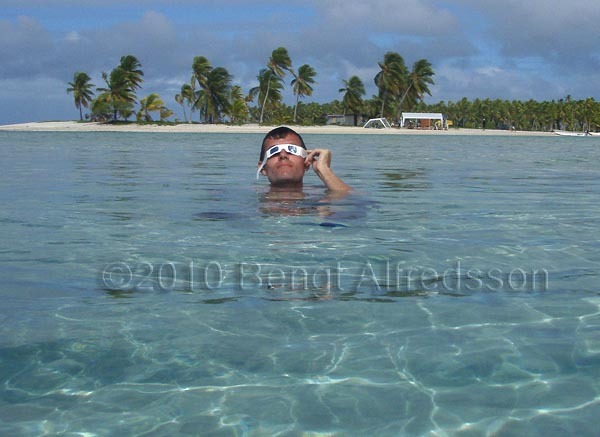 then we enjoyed some snorkeling along the reef. You really couldn’t want for more. Photo's above : © 2010 Geoff Sims. 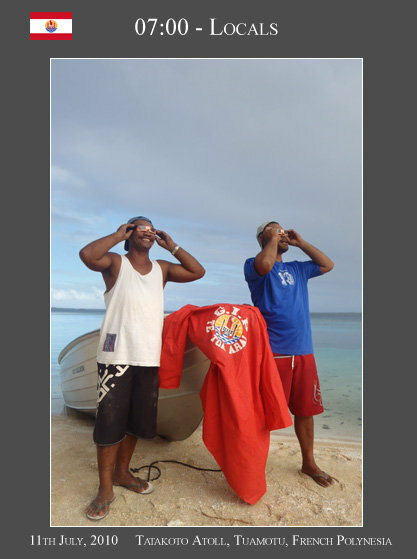 Left : Our boatmen Christian and Michel enjoy the partial phases through eclipse shades. Right: Geoff and Emily watch the closing stages of the eclipse. Left: Is this the coolest eclipse chasing photo ever? 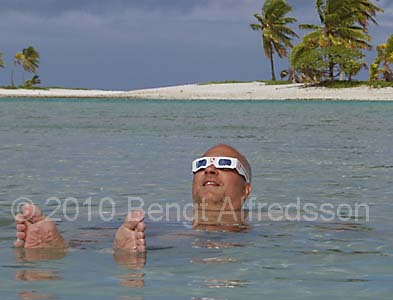 Bengt enjoys the partial eclipse after 3rd contact. Right : Who invited Lurch from the Addams family? Actually, it's Matthew Poulton, Brittish eclipse chaser who now lives and works in France. some tour administrators for the Tatakoto administration. Without his assistance our eye safety project would not have been nearly as successful. Finally a big thank you to the beautiful people of Tatakoto who have made us feel so welcome during our week long stay. Mauruuru Tatakoto! We will always remember you. of the eclipse, recorded in different media from video to film to written verse. Follow the links below to see images, videos and/or written reports by the individual team members. TSE2010 Home Page Group report as sent to SEML on July 14th. <- YOU ARE LOOKING AT THIS PAGE. 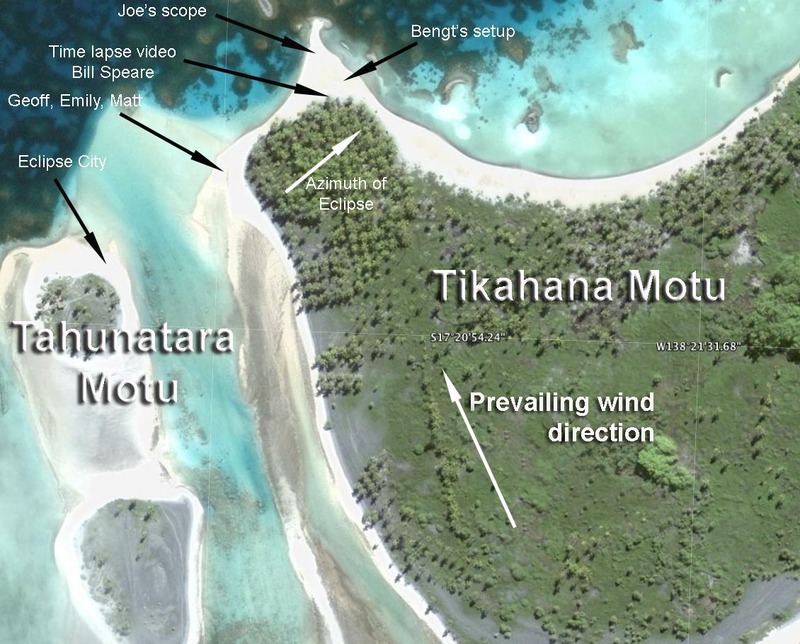 - flash gallery of general pictures from a great week on Tatakoto. Larry Stevens - Images from 90mm f11 Maksutov. 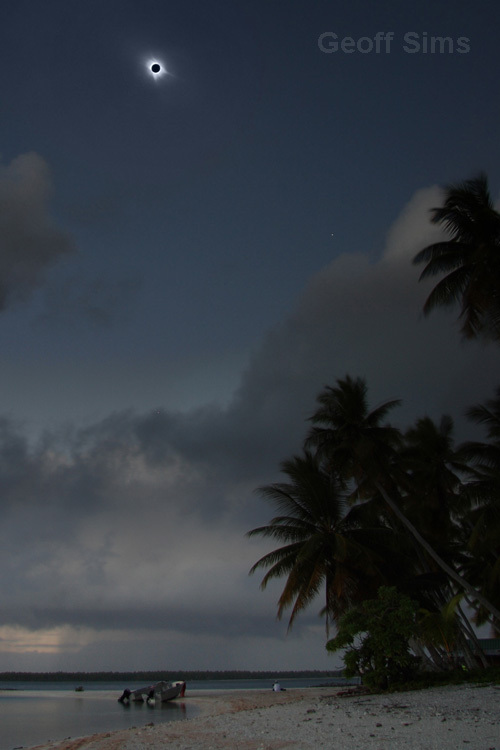 - one covering the eclipse and the other gives a great overview of our whole week on Tatakoto. Emily Love - Emily's impressions of her first total eclipse. 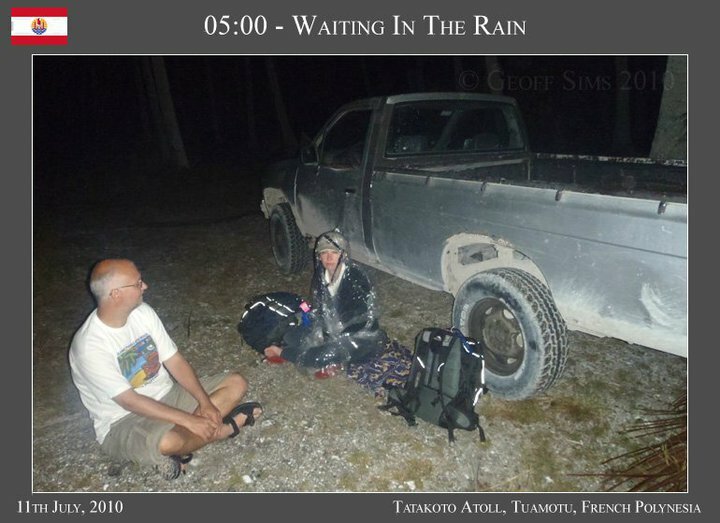 Bill Speare - Written passage recounting his impressions of his 27th totality. Bob Pine - Bob's account of the eclipse from the almost deserted town of Tumukuru ( the town on Tatakoto).